Sometimes some of the best storage devices come from reusing items that you already have. As I was working on my sewing room storage, I realized that I needed something better for all of my bobbins. I have a sewing box that is meant for storing my bobbins, and all of my other sewing supplies, but I just hate throwing everything into one container and calling it good. I end up wasting so much time fishing through my one large storage container that gets so messed up. It is kind of like trying to find something in my purse. Whatever I am looking for always ends up at the bottom. Since I typically have ten to twelve bobbins filled at one time with different colored threads, I don’t really want the loose ends getting wound up around each other and tangled into one big knot. This is undoubtedly what happens whenever I throw any kind of string together in one container. It is a recipe for disaster! It seems like I always have old picture frames laying around. For whatever reason, they no longer have a good use…..or maybe they do. I took one frame and painted it to match all of the other storage accessories in my craft room. I then filled the frame with some cork. You can buy cork in rolls to be cut to size or squares. I could have also just bought a regular bulletin board but I like to use what I have and I knew I would end up with a more attractive holder on the wall using my own frame. To hold the bobbins in place, I simply stuck 1 1/2 inch pins, with the big ball ends, into the cork and hung the bobbins from the pins. These were long enough and strong enough to hold a bobbin securely. Now each bobbin has it’s own space, far from becoming tangled up with another bobbin and I can easily see each color right in front of me. Not only do I keep my bobbins on the cork frame but I also have room to store small packages of needles and other light weight items. It ended up being a great storage item and I recycled a picture frame at the same time. This was a simple solution to a craft room storage problem that anyone can do. The more that you can organize, the less time you need to spend searching for your materials which means you have more time to work on your projects. 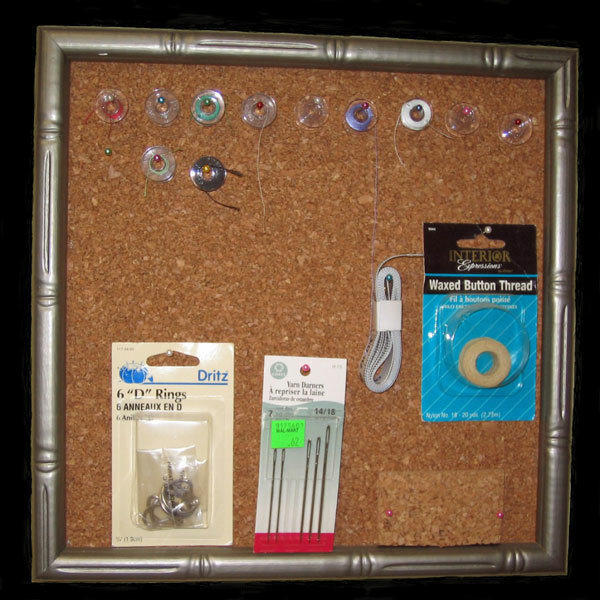 I have many more craft room storage tips that can help you to get and stay organized. What craft room storage tips do you have? I am always looking for some new ideas. Leave me your comments below!